Why Get Maintenance at All? Reduce Monthly Expenses: Boilers performing at their best will run more efficiently, and that means lower operational costs. 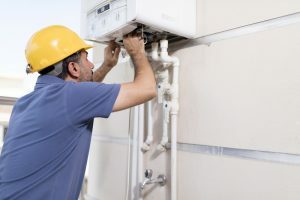 Increase Life Expectancy: Maintenance won’t make a boiler impervious to issues, but the reduced instance of problems will contribute to less wear-and-tear, thus to a greater life expectancy. Less Frequent Repair Calls: Maintenance is a preventive service, so it tends to correct the issues that most often lead to repair calls in the first place. Maintenance is recommended at least once a year—sometimes twice a year. The best time is just before firing up the system for the season. If maintenance is neglected for too long, several kinds of problems can arise. Gas Problems: In the case of owning a gas boiler, maintenance should be viewed as a requirement. Problems with gas lines can be deadly if allowed to persist for too long. Leaks: Leaks from temperature and pressure valves is part of normal operation. However, a leak due to corrosion or cracks is a serious issue that needs to be addressed immediately. Temperature Problems: Temperatures may fluctuate in a strange manner, or perhaps it takes longer than usual for the boiler to heat. Higher Heating Bills: A boiler struggling with a latent issue will struggle to heat the home sufficiently, leading to increased energy bills. Noises: Strange noises coming from the system can indicate many problems, such as kettling—the result of too many mineral deposits collecting in the boiler. Can Maintenance Solve Every Problem? Maintenance is the grease that keeps a boiler running smoothly throughout its life, but nothing can keep it running forever. A boiler that’s over 15 years old and frequently experiencing the above problems is most likely on its way toward needing a replacement. Having a replacement performed around this time can save a substantial amount of money in the long run. Otherwise, the costs of unnecessary repairs can add up to well beyond what’s normal. Don’t skip boiler maintenance! It’s never too late to schedule a maintenance check. Contact Yost & Campbell Heating, Cooling & Generators today to schedule a service.